As you know we like to travel as a family. We go on road trips often, places like Seattle, Whistler and Harrison Hot Spring, and we make one BIG TRIP a year to a sunny destination like California. We’ve traveled enough with our kids both as infants and toddlers to know the in’s and out’s including the best Baby Travel Gear. 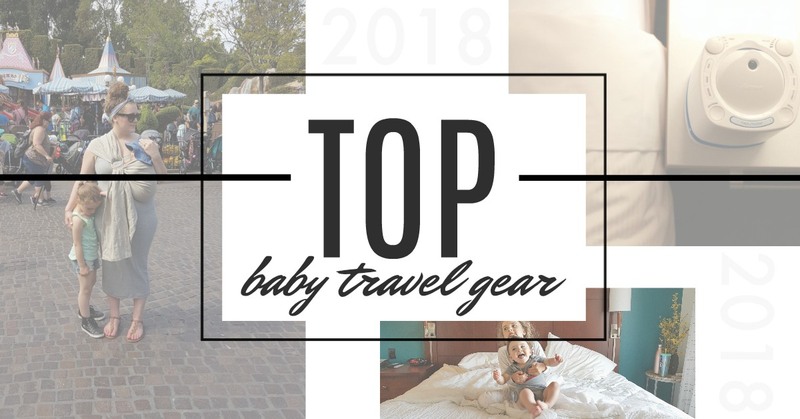 We wanted to compile a list of all our favorite things, making a great rescourse for those looking for TOP Baby Travel Gear for 2018. SLOW YOUR SCROLL; within the post we will also link up to our our favorite travel spots we’ve hit as a family. Including road trip hacks and ways to do travel affordably as a family. I’m convinced anything listed as on-the-go on amazon is pretty much a WIN in my books; including these Baby Sanitizer Wipes by Babyganics. Don’t get these mixed up with your baby wipes, these do more than clean dirty babes, they sanitize (and should not be used on deliciate tooshies). The best little on-the-go wipes are great for when you don’t have access to a washroom for hand-washing. Can you tell we frequent the Seattle Woodland Zoo? Traveling light is ideal when it comes to family travel, as you all know how much these littles need. Anything that you can down-size or avoid bringing will make the trip that more enjoyable. Less to keep track of. When travelng via plane the very last thing I want to be packing is a huge car seat. And it’s why a mifold is an abslute must (for kids ages 4 and up, 40 Ibs to 100 lbs and Height of 40″ to 57″ inches). Literally fits in a baby bag, including most purses and can be used in your car rentals, an Uber and Taxi. We can’t wait to travel with our’s in October; guess where we’re going? We don’t go anywhere without our whitenoise, incluing sleep-overs at Nana and Papa’s house. This Munchkin Sound System has also come in very handy at loud hotel’s, or when we all have to share a room. It’s cuts through any “bothersome” noises, like loud music, hotel neighbors or snoring (I won’t name name’s). It’s nice and compact, fits in a carry-on or suitcase nicely and ensures a good sleep each night. We even had it here in Whistler. I swear we take it everywhere. One time we got stuck in a hotel, ordering room service (as you do) with nowhere to sit a hangry baby. She had was not yet old enough to sit safely alone or even reach the table for that matter. It was one of those frustrating moments as parents knowing she would have to sit on our laps each meal. We vowed never again to travel without a highchair, when we could. But aftering finding this portable High Chair by Chicco, our baby traveling dreams were answered. With 3 adjustable heights, this compact travel High Chair is small enough to fit in a suitcase or even carry-on. We love all our Chicco purchases, they never dissapoint! I’ve come to the point in my life where I’m okay with the fact that the bottom of my purse is home to crunched up goldfish crackers and yogurt covered raisins. What I’m not okay with is that being the only snack available to my kids in a pinch. It’s why these adorable on-the-go snack cups are the best baby travel gear items for road trips and beyond. We never travel anywhere, including the grocery store, without snacks. I would hate to see our family fresh outta’ snacks! The last time we were in Disneyland Stella was 6 months and spent a good deal of time in our arms. It was the first time we did a trip with her and we were a bit worried on how she would do in the parks during her nap. I made sure to have everything available, from a stroller that folded down, to a carrier both Sam and I loved. She surprised us both and slept in both places comfortably. Fast forward to today, where she clocks in at 25lbs, I feared the ship had sailed on the whole baby carrier thing. But after asking our Mama-Tribe on Facebook we found quite a few carriers for older/bigger babes. We decided on WeMadeMe by Diono for babes 24lbs to 55lbs and can be both used as a front carrier and back. Stella loves to be carried, HECK! so does Sofia and she’s nearly 7. As discusting as the concept of the NoseFrida is, I would not go on a trip without it. Should baby get sick while on vacation, the least you can be is prepared. Nothing is worst than a stuffed up child while on the beaches in Hawaii. Babies are usually pretty resiliant and for the most part while they’re ill will make the most of the aventures. But when the night hits, it’s when the real struggles happen. The NoseFrida helps to clear their airway, get a good nights rest, and is exactly what they need to get better fast. We always travel with a little first-aid kit, some medicines and the NoseFrida. ALWAYS! Now we would NEVER travel with this on the plane, but for our road trips we have most definatly put some serious millage on our portable Wooden Crib. We know there are a ton of options out there for travel cribs, but we never found one we fell in love with, one that we were 110% comfortable with. In hunting for other options we looked into mini cribs and found this folding portable Wooden Crib by Delta. Great for small spaces, should you live in an apartment and better yet great for those that road trip often and like the luxurious of home for their babes. This crib folds flat, about 7″ thick, is the first thing that goes in the car when we start packing takes up nearly no room at all. Love our portable Crib and 110% make our list of TOP Baby Travel Gear for 2018. Doesn’t matter what vacation you go on, you will never get away from LAUNDRY. Sorry, this is a fact. In the past I have used trash bags and as much as they “do the trick” they’re far from the ideal. I like to stay very organized when we travel, not only just our itinerary, passports and reservations but also our dirty clothes. I like to have 3 laundry bags. 1 for the girls, 1 for myself and 1 for Sam. When we get home, this streamlines the whole process of unpacking. I simply wash one bag at a time, INCLUDING the bag itself, getting through all the loads in record time. You also might want to consider getting a seperate wet bag to hold any swimsuits or wet items. This travel laundry bag makes me feel like I got my ‘ish together. While on vacation, accidents still happen, so does teething and so do allergic reactions (take my word for it). It’s why some of our TOP Baby Travel Gear items consist of Fever and Pain medication, Homeopathic Teething remedies and Allergy meds. It’s an almost guarentee should you not pack them, something will happen. Tylenol and Benadryl are sorta’ a no-brainer but Camilia may be new to some. For those of you traveling with a baby, Camilia is the only thing that has ever worked for our girls and their teething pain. This little first-aid kit goes everywhere with us. Cearly we couldn’t go on a trip souly with these 10 items, but you can bet I wouldn’t leave home on a trip without. Hopefully you’ve found our list of the TOP Baby Travel Gear for 2018 helpful and will make all your future travels with kids a bit more stress-free. We love that it puts our minds at ease when we travel as a family, knowing we’re ready for whatever the vacation throws our way. Disclosure: I have partnered with Diono, Chicco and mifold to share our experience.